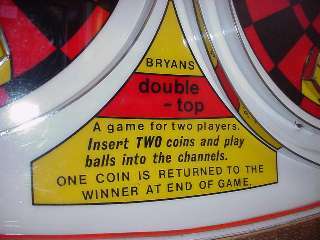 Bryans 2-player Games, Worl Borl, Double Top, All Sport, etc. This page contains details of Bryans four 2-player games. In general, no payout was given with this type of game, as the reward was in beating the other player. 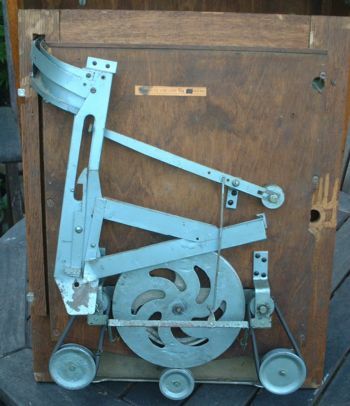 This has the advantage of simplifying the mechanism. However, the Double Top did return the coin to the winning player. 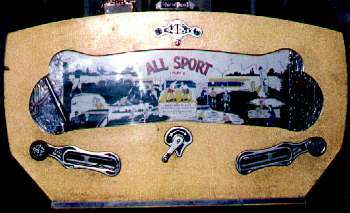 The All Sport was a 2-player game. 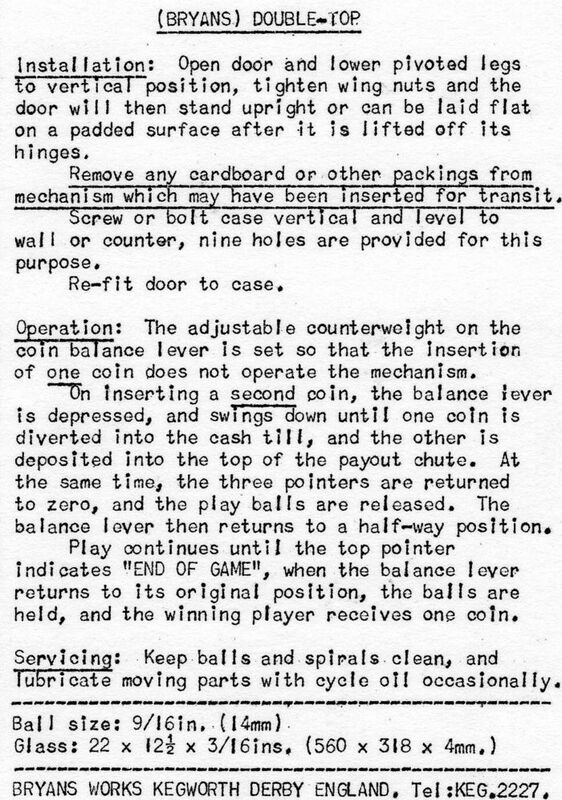 On inserting a coin and turning the handle in the centre, one ball at a time is fed to each player. Players attempt to knock the balls past their opponent, into the opponent's goal. Each player is provided with a knob which controls a rotating paddle directly in front of the goal. No payout was given, and the number of goals scored could be counted up at the end of the game, by counting the balls collected in each gallery at the bottom. The gameplay was similar to the later Worl Borl, except that the balls were initially distributed evenly to each player, rather than randomly. 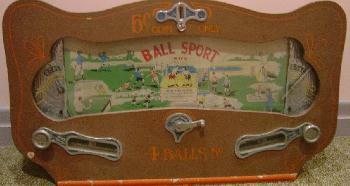 Original shape of the All Sport case. All Sports were usually given a fleck paint finish, in yellow, red, or blue and silver. Three examples have also been seen in the veneered case on the right. See case styles. This unusual variant has come to light in Australia. 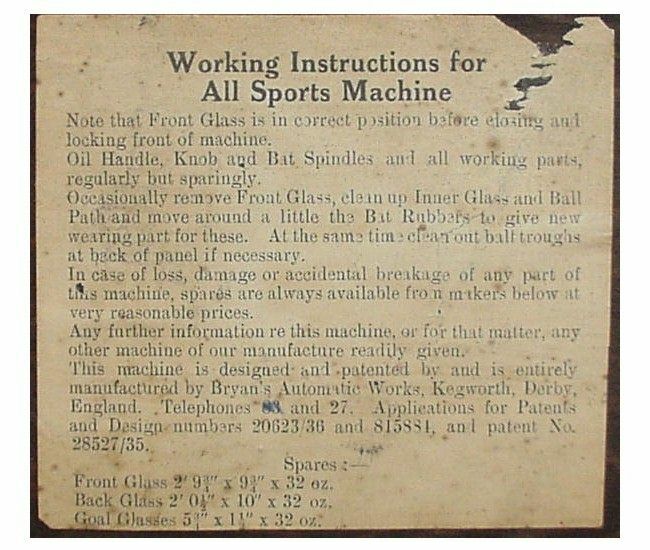 The backflash has 'Ball Sport' printed on it instead of 'All Sport'. My first reaction was that some joker had simply added the extra 'B' on afterwards, especially as the rest of the casework has non-standard decoration! However, after careful study and comparison with a normal backflash, it does appear that the Ball Sport backflash is genuine, and did originate from the Bryans factory. Judge for yourself by seeing a close-up of both backflashes. 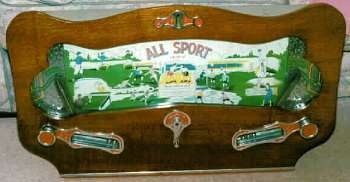 As this machine is in the earlier case style it can be deduced that the Ball Sport came before the All Sport rather than the other way round. This indicates that this game was originally called Ball Sport, and was later changed to All Sport. As this is the only example to come to light so far, the name change must have been very soon after the game was introduced. Experience has shown that mysterious and trivial name changes like this are often done for legal reasons (eg. Rol-A-Tor / Rol-A-Top) to avoid a conflict with another manufacturer's product. But whether this is the case here I have no idea. 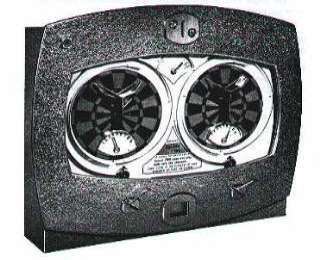 This very compact game was housed in a standard Allwin case. Each player has a knob to control his figure's rotating bat. The idea is to knock the balls over the head of your opponent's figure into the space behind. The player scoring the most 'Goals' wins the game. There was no payout. This machine was similar to the All Sport, except that the balls are randomly distributed to each player by feeding them through a wire maze. 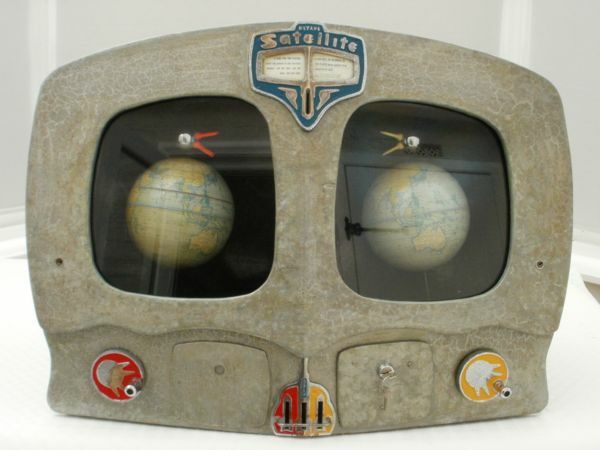 This game was introduced in 1958, to take advantage of the interest generated by 'Sputnik', the first artificial satellite. It was a simple 2-player game. 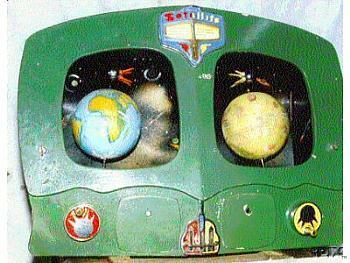 Upon turning the handle, each player would cause his satellite to revolve around the earth. The first player to encircle the planet would have his penny returned. 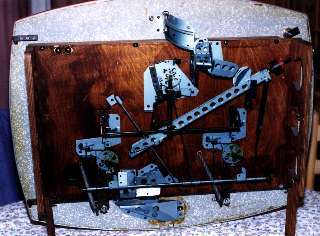 Speed regulators were fitted to the mechanism, so that the satellites would stop if the handle was turned above a certain speed. 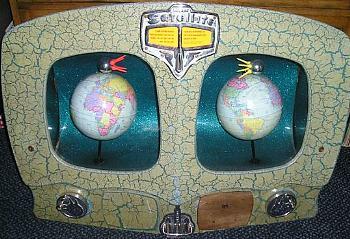 The planets were actually Chad Valley globes, so they were fully detailed (see right). This was a very attractive themed game, with bright colours, chromium satellites, colourful globes, and a backdrop of shimmering stars. The globes themselves also rotated slowly during the game. 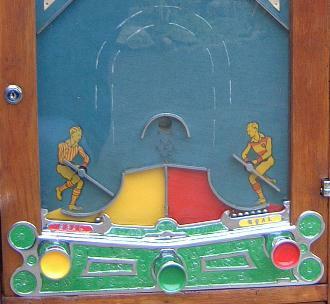 The Double Top was a very unusual game. It was an Allwin for 2 players, and consisted of two Allwins side-by-side in the same case. The artwork represented a pair of dartboards, hence the name. Each player would insert a penny and try to shoot their ball into the central cup a total of nine times. Both Allwins had counters to count the number of wins. 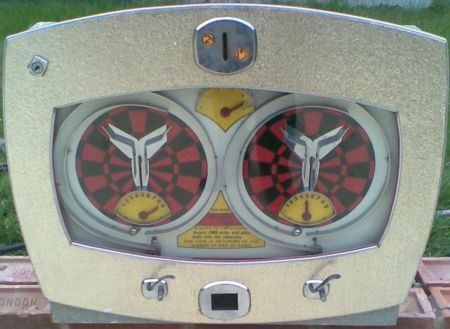 When the dial at the top had finished counting down, the machine would lock the balls and a coin was returned to the player who had scored the most hits. 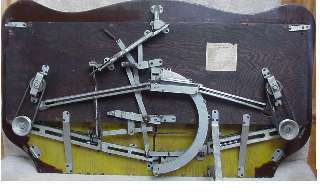 The Double Top was William Bryan's last design. The Double Top was over-complex and not very successful. Only 54 were made. Most players didn't even realise that it was a 2-player game! !